Author of Biographia Literaria (1817) and The Friend (1809-10,1812 and 1818), Samuel Taylor Coleridge was the central figure in the British transmission of German idealism in the nineteenth century. The advent of Immanuel Kant in Coleridge's thought is traditionally seen as the start of the poet's turn towards an internalized Romanticism. Demonstrating that Coleridge's discovery of Kant came at an earlier point than has been previously recognized, this book examines the historical roots of Coleridge's life-long preoccupation with Kant over a period of twenty years from the first extant Kant entry until the publication of his autobiography. 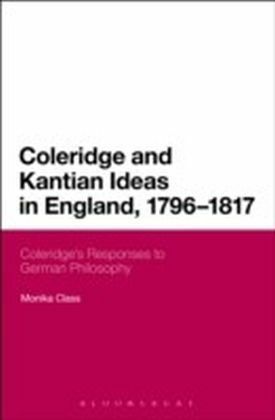 Drawing on previously unpublished contemporary reviews of Kant and seeking socio-political meaning outside the literary canon in the English radical circles of the 1790s, Monika Class here establishes conceptual affinities between Coleridge's writings and that of Kant's earliest English mediators and in doing so revises Coleridge's allegedly non-political response to Kant.